In late 2008, in the middle of the Great Recession, the struggling downtown area in Vancouver, Wash. decided to make a change. A cheap change, but a big change. In essence, it painted a yellow line down the middle of Main Street, changed some signage and traffic lights, and opened the street to two-way traffic. The results were almost instantaneous. Within a few short weeks, the businesses downtown reported a massive surge in customers. And why not? Two-way streets better encourage pedestrian activity, smooth and slow traffic, and, perhaps most critically for Spokane, ease the difficulty of finding a metered parking spot. They’re also easier to navigate for visitors and residents alike. One-way streets are literally a relic of our nation’s Cold War-era past, built primarily to allow for swift evacuations and troop deployments in the aftermath of a nuclear attack. So let’s return to a two-way street grid downtown. Sure, it’ll be harder to convert the Lincoln/Monroe and Division/Browne couplets, but other streets could be converted with relatively little difficulty. Like Stevens. Like Washington. Like Sprague. Like First Avenue. And of course, like Main Avenue. City officials and East End businesses have been working for years on a project that would add center-lane parking on Main Avenue, but for little apparent reason maintain that street’s one-way status. That’s absurd. Converting the street to serve both eastbound and westbound traffic would enhance both the pedestrian and the vehicular experience, improving navigation, parking, and the streetscape. It’s time to stop talking. 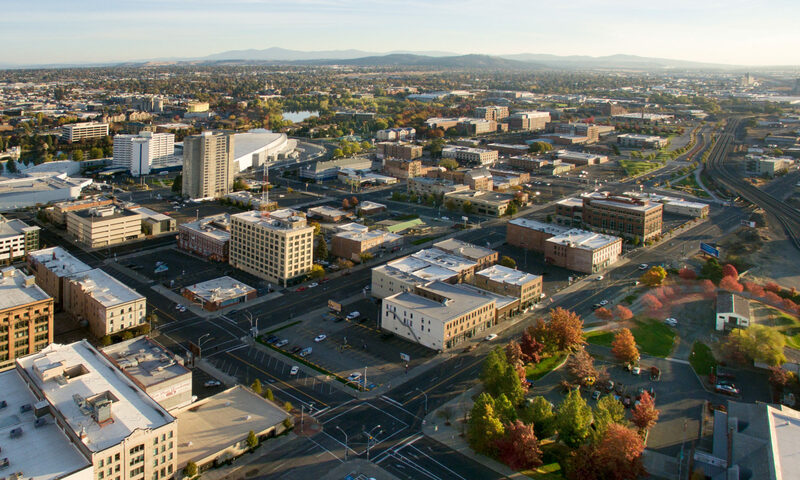 Downtown Spokane should be a people-friendly place, welcoming to all types of commuters–pedestrians, bicyclists, transit users, and drivers. It should make navigation simple and easy, and walking a breeze. Vitality on the sidewalk should be the first and foremost priority. And the potential here is huge. So let’s make it happen. Let’s convert more streets downtown to two-way traffic. SHARE YOUR THOUGHTS: What do you think? Should Main Avenue and potentially other streets downtown be converted back to two-way status? Why do you think there hasn’t been more progress on this in recent years? And would you be more likely to go downtown if navigation and parking were enhanced along with the pedestrian experience? Share your thoughts on Facebook, on Twitter, and in the comments below. We love to hear from you.